TOKYO — People stranded at a flooded offshore airport overnight returned by boat and bus to the Japanese mainland Wednesday after a typhoon swept across part of Japan’s main island. Japanese broadcaster NHK showed aerial footage of the boat and a caravan of buses transporting about 3,000 people from Kansai International Airport across a partially damaged bridge under sunny skies. The airport that serves Osaka, one of Japan’s largest cities, remains closed. Typhoon Jebi peeled roofs off buildings, toppled power poles and damaged businesses as it crossed Japan’s main island Tuesday. Japanese media tallied at least nine deaths, and the Fire and Disaster Management Agency said nearly 300 people were injured. More than half a million households in and around Osaka remained without power Wednesday morning. Jebi, reportedly the strongest typhoon to make landfall in Japan since 1993, has been downgraded to a tropical storm and is heading north of Japan. 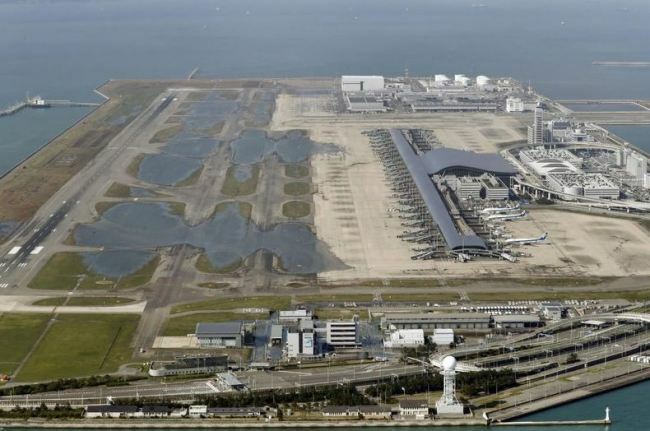 Kansai International Airport is built on two artificial islands in Osaka Bay, and the high seas flooded one of the runways, cargo storage and other facilities, said the Ministry of Land, Infrastructure, Transport and Tourism. One passenger was slightly injured by shards from a window shattered by the storm. A tanker that was mooring slammed into the side of a bridge connecting the airport to the mainland, damaging the bridge and leaving people stranded overnight, transport ministry official Mitsuo Nakao said. A speed boat ferried the stranded passengers from the airport to a nearby Kobe port, while others took buses that used one of the two roads on the bridge that remained intact after the tanker clash. Appearing relieved but exhausted, passengers said they had to spend the night feeling uneasy in the dark. Hideko Senoo, a 51-year-old homemaker who was planning a family trip to India, said the terminal was hot and dark due to power outage, and she could not even buy drinks at vending machines after food at convenience stores were all sold out. “We could not use vending machines or access to wireless local network to get information, and we didn’t even know about this boat service,” she told Kyodo News. The tanker was also damaged, but all its 11 crewmembers were not injured and rescued safely, according to the coast guard. The heavily damaged ship has been pulled away from the bridge into nearby open waters. The deaths included a man in his 70s who was blown to the ground from his apartment in Osaka prefecture. Police said five others died elsewhere in the prefecture after being hit by flying objects or falling from their apartments. In nearby Shiga prefecture, a 71-year-old man died when a storage building collapsed on him, and a man in his 70s died after falling from a roof in Mie, officials said. Daihatsu Motor Co. stopped production at its Kyoto and Osaka factories, while Panasonic halted work at its air conditioning and refrigerator factory in Shiga. Major beverage maker Kirin Co. suspended production at its brewery in Kobe, according to Kyodo News agency. In nearby Nishinomiya in Hyogo prefecture, about 100 cars at a seaside dealership burned after their electrical systems were shorted out by sea water, fire officials and news reports said.